The residence Les Valmonts de Vaujany is located in an authentic village, 1250m above sea level facing the Grandes Rousses and Alpe d'Huez. The resort is ideal for lovers of the mountains and nature. The residence welcomes you in one of its 24 fully equipped and comfortable apartments. You will enjoy a moment of relaxation thanks to the sauna and the hammam which will be at your disposal for any stay of 7nuits. 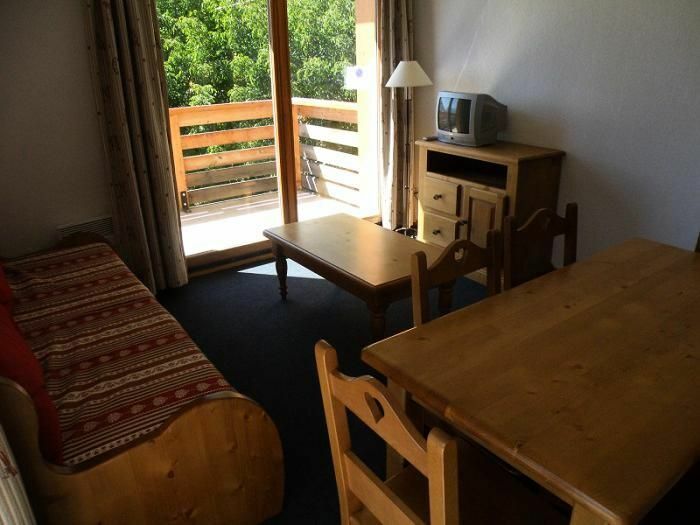 The Valmonts de Vaujany are perfectly located at 100m from shops with shopping arcade, various restaurants and their starting activities in the mountains. The resort offers many activities during the season: walks, hiking, mountain biking, swimming pool, ice rink, bowling, entertainment and themed events. The resort of Vaujany gives access to the ski area of Alpe d'Huez by cable car connection. 2 room apartment of 35m² for up to 4 people with kitchen corner, living room with double sofa bed, bedroom with double bed, bathroom or shower and WC separated or not. The accommodation will provide you with a TV and a balcony. Note: The bed linen and towels are extra. Grenoble to Vaujany (50 km) RN 91 towards Briançon then Valley Water Olle - Vaujany. TGV Paris - Grenoble (3 hours), regular service by coach Grenoble / Bourg d'Oisans / Vaujany live during the winter school holidays.